I have a problem and I hope those of you who follow my blog may be able to offer assistance. Please feel free to comment here or email me privately. I want to make needlepoint advent candles for each of my sons’ families. I have the design concept in my head, I have the threads in mind and of course the colors will be purple and pink; but for the life of me I cannot figure out the finishing. I can see the finished candles, I just cannot figure out how to do it and it may make a difference in how I stitch the tops and sides. I think it would be easier to access the candles from the top, but am not sure. 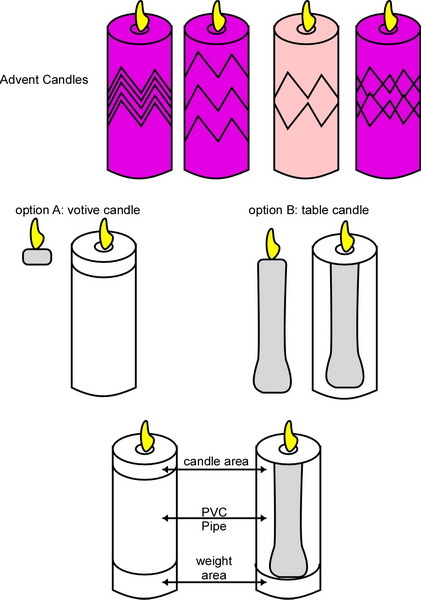 I am going to use either the small battery-powered candles that look like votive candles (option A and I think these would definitely have to be accessed from the top) or the table candles (option B and these probably could be accessed from either end). Each of these presents their own problems. Option A: Votive candle will require an insert to set the candle on. Option B: Full candle will also have to be accessible. I thought about PVC pipe with a top area to hold votive, and a bottom area for weight, but I couldn’t find all the right parts to make these…I guess I could go to a plumbing shop and get some help, but it would probably be expensive to make these. I also thought about making cardboard tubes but wasn’t sure this would be heavy enough. I can use aquarium gravel for the weight and make muslin bags to put gravel in. I just can’t see the finishing and it is keeping me from starting because I am not sure until I make this decision how large the sides of the canvas will need to be to cover the finishing forms. Any ideas? I’ll keep everyone posted.